The expansion of human knowledge that springs from the inquiries of science can become a profound resource for our faith traditions. We need not choose between faith and reason as the rejection of reason often leads to a failure of faith. The high calling of the scientific community is to bring the realities of our universe into sharper focus. Our faith traditions enable us to discern meaning and understanding in our lives that cannot be realized by examining facts alone. Both the knowledge we are gaining from science along with the deep insights that we gain from our faith stories provide light and encouragement for navigating our human journeys. The hope and compassion and embodiments of grace that we experience within our communities of faith and the new knowledge we discovered through explorations of our world, such as the now-famous discovery of the “god particle,” can come together to lead us toward a better understanding of ourselves and our world. We are learning that the universe, including ourselves, is a constellation of creative interdependence. There are no isolated entities in the world, including our individual lives. The solitary individual is a fiction. Our relational lives are central to our being. A sustainable faith should engage our minds as a critical resource for sound belief. Every believer can become a thoughtful believer and every thoughtful person can find hope and insight for living from our stories of faith. Thinking and believing work together to enable us to live more fully enlightened lives. 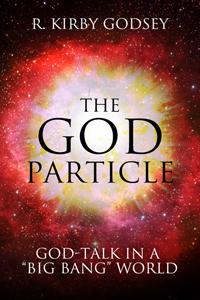 In THE GOD PARTICLE, R. Kirby Godsey surprisingly bridges the science-religion divide without the need to endure brain- and soul-stretching philosophical calisthenics to get there. The result is a book that’s not so much about squaring religion with science, but rather about presenting a way to think about science that allows for religion. This is, thankfully, not one of those books that attempts to find scientific explanations for, say, Noah’s flood or the parting of the Red Sea. “Confusing religious stories with science leads to bad religion and bad science,” Godsey writes. Instead, religion can be useful as metaphor to help understand science. But that’s not a new idea. What is unique is that he offers the science-minded a way that they can think about religion that does not compromise the known, measurable universe. Science teaches that, on the atomic level, nothing is solid. The particles that make up the universe, the Earth, and all its creatures, are mostly empty space and energy. So, a rock and a human are both a configuration of energy. Rocks and people fall apart, but energy does not. Godsey chooses to think of this combination of energy as spiritual, and the connections between them as a constant state of God. This, Godsey asserts, is where concepts of religion and God can live with scientific reality. He takes an almost kabbalistic approach to the idea of God. We are all God. “God is a verb,” a constant result of the act of interconnectedness. This point of view will likely make neither the religious nor the science-minded happy generally, though a few might make the connection. This is a change in the way that the religious can think of God and the way that scientists can view the concept of energy, time, and space. In this way, there is no difference at all between science and religion. The two are merely different ways of interpreting the same universal phenomena. Getting there will take a leap of faith from both sides, but it’s a worthwhile leap to consider, and reading THE GOD PARTICLE would be a good first step. While gifted in many ways, R. Kirby Godsey is at his core a philosopher with a thoughtful Christian orientation. So not surprising, his book, THE GOD PARTICLE: GOD-TALK IN A "BIG BANG" WORLD, may be the most philosophical of his five published works-—though each reveals that trait. Many readers find his theoretical thinking to be insightful and helpful while others question his orthodoxy (especially if such orthodoxy is narrowly defined and defensively held). Godsey’s insights may be most helpful to those (if they are willing to hear and heed) who confuse a firm faith with a mind that is set in concrete regarding all that is true. Even if one disagrees with Godsey—as many Christians will surely do in his considerations of the existence and nature of God—his reminder (like that of St. Paul) is needed: we see through murky glass. Godsey stands opposite from those strident voices today who create unnecessary division—even battles—over issues of scientific discoveries and religious dogma. He advocates for a less defensive position that allows for various forms of truth to inform rather than restrict each other. His is a better way.